As a film critic, one of the most common questions I’m asked (besides the most precarious of queries: “What’s your favorite movie?”) is, “What do you think of [insert highly lauded/popular film here]?” Usually, people want to hear my thoughts on a film with a reputation that’s become so ridiculously hyperbolized it makes enjoying it for the common, everyday moviegoer a near-impossible task. Take, for instance, Orson Welles’ seminal film from 1941, “Citizen Kane.” This, understandably given its reputation as “the greatest film of all time,” is THE film I’m asked about most often, to which I respond that it is a truly great film. I talk about how influential it’s been on cinema, how it’s endured and aged gracefully, remaining relevant to this day. On just a technical level, ‘Kane’ was so ahead of its time that it must have seemed like a film from alien planet upon its release, using bold camera techniques and angles, montage, and pretty much every tool in the cinematic shed available to a filmmaker to create a truly brilliant piece of art. This explanation never seems satisfying: if my interrogator wasn’t entertained by “Citizen Kane,” it’s going to be hard to redeem it. This is all fair enough. Taste is subjective, of course. But these recurring instances have inspired me to seek out films with “classic” status stamped upon them (read: movie nerds salivating like Homer Simpson waiting to eat pork chops) and help steer good, down-to-earth, movie-going folks towards something that will in fact please them. Still, the best films, my personal favorites, the ones that I recommend most heartily to anyone who enjoys good cinema, tend to be those that work on many levels. Not just as entertainment, but as a layered, beautiful piece of art. You can enjoy the often visceral, surface thrills, but if you care to look deeper, the film experience can be enriched to an often-magical degree in these rare instances. This 1931 masterpiece (there’s that word again) of German cinema has been lovingly, painstakingly restored by TLEFilms Film Restoration & Preservation Services (Berlin) and will screen in the DCP format at Cinema 21 beginning this Friday (March 29) and running for a week. I’ve already had a chance to see this version of the film at Cinema 21, and let me assure any cinephiles out there decrying digital projection that “M” looks stunning in this format. Do I still prefer 35mm film prints to DCP? Yes, I do. But DCP is very close to catching up with the warmth of our trusted analog. The best evidence is in older films given the digital treatment. The look and feel of film, that oh-so-lovely grainy quality with its deep blacks and shadows, is very nearly retained in this 2K restoration. So, technical jargon and fear of the oncoming cinematic digital revolution aside, what makes “M” so great? A lot. This film, which Lang (who also made “Metropolis” and the ‘Dr. Mabuse’ films) declared his personal favorite among his creations, is still, more than 80 years since its release, miraculously pertinent. It has not aged like a fine wine, which has an eventual, definite peak and then a decline. “M” is more akin to whiskey in that it got better after a few decades of time, but now has retained its very high quality through to the present. It’s endured, and will continue to do so. 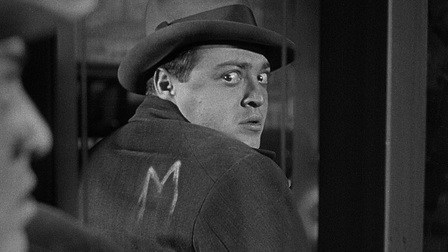 Some of the reasons for this are obvious and often cited: the complex, layered storyline about a serial killer who can’t stop killing little girls and the town that bands together to catch him; the innovative use of cross-cutting techniques used to push the narrative further through multiple, parallel planes of story and character; Peter Lorre’s incredible, breakthrough performance as the killer; the inventive, experimental and dense use of sound (Lang’s first foray with the then-new technology) that uses a narrator, off-camera sound effects, leitmotifs and motivating action and suspenseful moments of silence before a sudden noise, to great effect; stunning cinematography, by Fritz Arno Wagner, that employs shadow to great effect but also moving, panning cameras in ways that were rarely, if ever, seen at the time. But the thing about “M” that’s helped it retain a sense of fresh modernity—even in today’s cinematic climate that, at a glance, is broad, hectic, violent, overstuffed, impatient and seemingly more advanced in every way imaginable—is that, as far as I can tell, it’s one of, if not the first example of a genre mashup. Except that Lang and his cast and crew didn’t have any concept of, or even a name for what they were doing. It just happened through coincidence and the natural evolution of art that’s seen low, middle and high cultures become fascinated with combining, layering, deconstructing and re-appropriating old genres and artworks into something entirely new. Think I sound nuts? Just look at all the “types” of movies that “M” actually is: serial killer, horror, thriller, crime, police procedural, heist, family melodrama, noir, mob mentality, courtroom drama. Those ten genres or sub-genres very clearly make up the whole of “M.” Arguably, it’s the most mashed-up of all genre mashups, even to this day. Lang proves to have a deft touch weaving in and out of all these genres, seemingly with ease. The biggest miracle in “M” is that all these disparate elements never feel out of place. They’re all of a whole, strong individually but even stronger as one grand, cohesive story. The measure of its influence on countless other films is perhaps best described as a snowball that never stops rolling, with each film in its debt expanding “M” into a giant, unstoppable frozen white mass that could swallow a city whole. All of the varied aforementioned genres plus the stylistics in “M” have been usurped to such a degree that many don’t realize where it all came from. “M” is THE original, and while I’d never say accept no substitutes (as I love many films that have referenced or paid homage to it), I do think there’s a wealth of knowledge and interest to be gleaned from seeing the seed that sprouted so many films we love. David Fincher’s “Zodiac” and “Seven” clearly worship at the altar of Lang’s film. Quentin Tarantino and his countless imitators wouldn’t exist were it not for “M.” The recent, excellent wave of South Korean films this past decade is steeped in genre mashing, in fact “Lady Vengeance,” from Park Chan-wook has an eerily similar kangaroo court finale that’s lifted nearly wholesale from “M.” The murky, grey complexities of HBO’s “The Wire” and that show’s determination to show the viewer all angles of a crime, that was from Lang (as is the idea of the main character and the setting—for “The Wire” it was Baltimore, in the case of “M” it’s an unnamed German city). The reach of “M” expands as you dig. We hear whistling of “In the Hall of the Mountain King” (which has been used to death in all kinds of films, TV shows and commercials) whenever the killer is near. The iconic John Williams score in “Jaws” signals the presence of the shark in the same way. Then there’s the use of montage and time-compressing/overlapping editing techniques that’s proven to be the gold standard of the most talented and successful Hollywood filmmaker working today, Christopher Nolan (“Inception,” “The Dark Knight” Trilogy), among many others. It never ends, but this article must. And rather leave you with thoughts about how “important and influential” it is, maybe it’s better just to say that “M” is first and foremost a terrific and immensely entertaining film. So whether you want the surface thrills, action and, yes, a few laughs (honest), or you want to dig and dig and dig into the never-ending genealogy that charts the influence of “M” on cinema, you’re in for a treat. 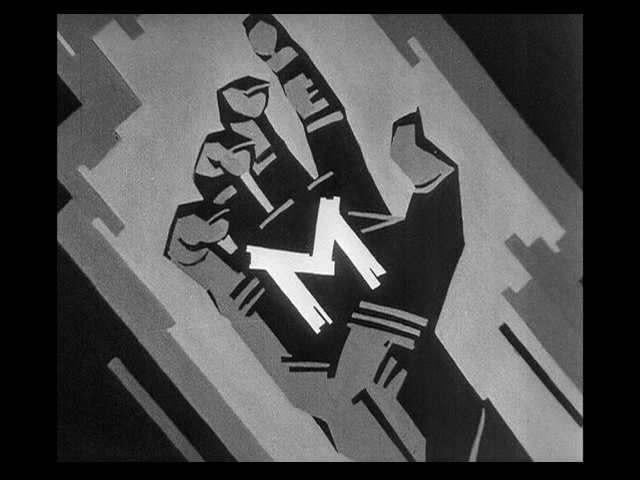 An earlier version incorrectly stated that the Munich Film Archive restored this version of “M.” It was actually done by TLEFilms Film Restoration & Preservation Services (Berlin). Erik McClanahan is a film critic, journalist, podcaster, projectionist and manager (the latter two for The Northwest Film Center) living in Portland, OR. New episodes of his film podcast, Adjust Your Tracking, are released every Thursday.